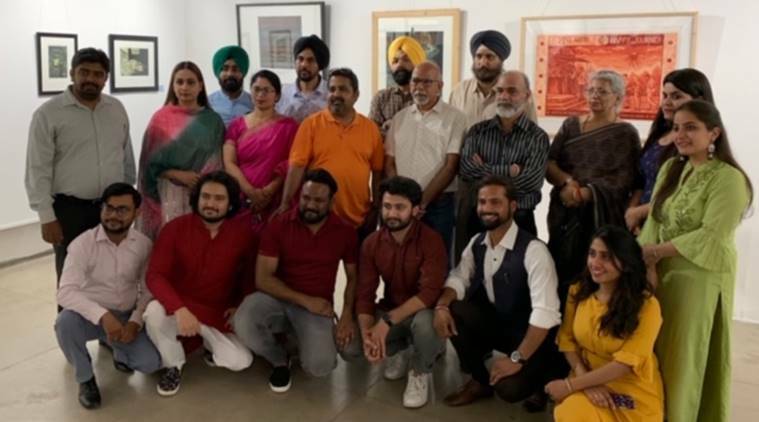 ‘The printmakers’, a four-day exhibition featuring the works of 21 local printmakers, along with prints of eminent artists like Kavita Nayar and Jagmohan Chopra, started Wednesday at Government Museum and Art Gallery in Chandigarh. The City Beautiful is set to give the art of printmaking a much-needed impetus and the growing community of printmakers a chance to showcase their new experiments. “The exhibition is dedicated to Jagmohan Chopra, an artist who was responsible for popularising printmaking in Chandigarh. Chopra was awarded the Kala Ratna in 1988 for his expertise in the field. He played a pivotal role in setting up the printmaking studio at the Government College of Art, during his tenure as the principal here,” says Rahul Dhiman, a graduate from the Government College of Art, who is showcasing two of his works, with journey of life as its theme, in the exhibition. Nirmal P Sharma, another artist who is part of the exhibition, believes ‘The Printmakers’ is an important platform to create awareness about printmaking, which is a technical art form. “People are not very aware about it, as painting and drawing are the more popular mediums,” says Sharma, who hopes to help organise more workshops and exhibitions on printmaking in the future. The artist feels printmaking is unique because you can create copies of a design, each print original. Sharma’s print titled ‘Weeping Animal’ depicts an animal’s head with two weeping eyes beside it, as he attempts to highlight cruelty towards animals with this work. “This work emerges from the fact that no one questions the pain being inflicted on the horse by the cart owner. Even animals cry, but no one feels for them,” adds the artist. In her work, ‘Cut from society’, she shows a scissor with a girl in the background, the core philosophy being the restrictions imposed on a girl child by society. Mini Puri, a teacher from Bhavan Vidyalaya, has two of her prints on display here and says that the exhibition encouraged her to print after over two decades. The exhibition is on till April 13.